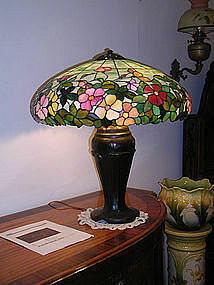 Fabulous leaded glass shade by John Morgan and Sons of New York. 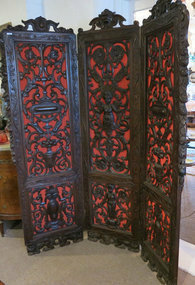 This beautiful piece of craftsmanship has a mottled green background with pink, orange, red and yellow flowers. When lit, the colors are absolutely phenomenal. The shade, which measures 23" in diameter, proudly sits upon a beautiful Handel base. 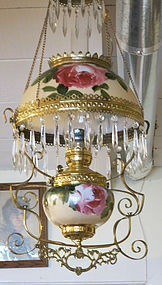 The whole lamp measures 24" tall and would stand out in any room. It is in excellent condition. 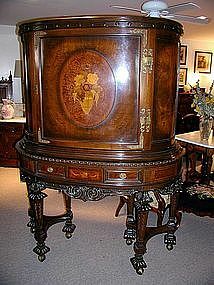 Beautiful solid mahogany partner's desk made by New York cabinet maker R. J. Horner circa 1900. The desk measures 30" tall x 53" wide x 33" deep. It is supported by four exquisite winged griffins who seem to be guarding whomever sits at it. 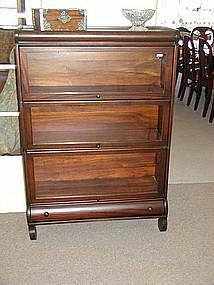 There are two long drawers at the top, one opening at each side. This wonderful desk is in excellent condition and would definitely be the focal point of any room it sits in. 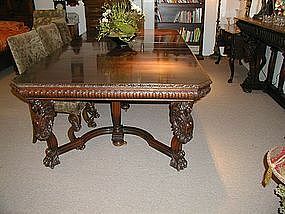 Beautiful carved solid mahogany dining table by R.J. Horner, New York. Legs carved with beautiful women with garlands of flowers. 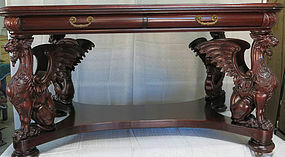 Table measures 54" square x 30 1/2" tall, and has 3 additional leaved making it 98" long when completely extended. Center leg for stability. In beautiful condition. 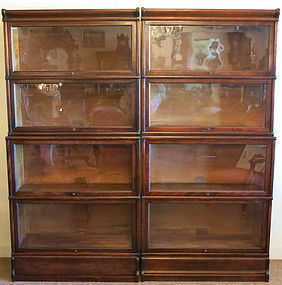 Beautiful American walnut Renaissance Revival four-door bookcase. 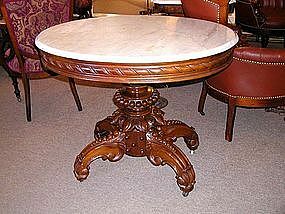 This beautiful piece is circa 1870, completely professionally restored. It measures 71" tall at the center and 66" tall at each end. It has four doors and four drawers underneath. The bookcase measures 14" deep at its center, and 11" deep at each end. It is 80" wide and ready to go into your home. 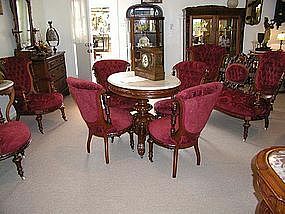 Lovely set of eight American oak dining chairs consisting of two armchairs and six side chairs. They all measure 39" tall, and have paw feet in front. 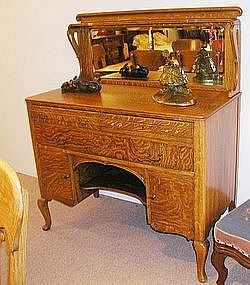 Lovely American tiger oak server with bevelled mirrored back, two drawers over one long drawer over two doors with a small shelf between them. 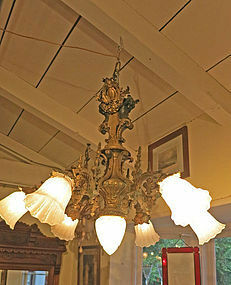 It has Queen Anne legs and the moulding on top of the mirror is curved, ending with small rosettes. Thie piece measures 45" wide x 56" tall x 22 1/2" deep. 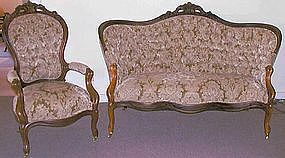 Beautiful rosewood settee and matching armchair, attributed to Thomas Brooks, circa 1870. Settee measures 6'7" long x 33" deep x 43" tall. 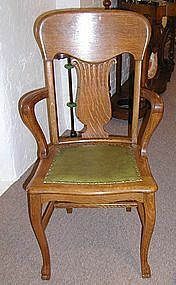 Armchair measures 27" wide x 33" deep x 45" tall. Both pieces have been professionally restored to their original condition and newly upholstered. Beautiful walnut burl three piece Renaissance Revival bedroom set circa 1880 consisting of bed measuring 64" wide x 80" long x 7'8" tall; marble top washstand measuring 32" wide x 21" deep x 47" tall; marble top dresser measuring 44" wide x 22" deep x 8' tall. 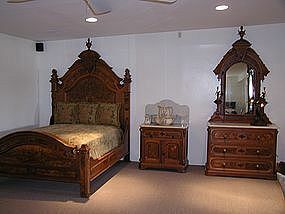 Both the bed and dresser have urn finials, and the whole set is in immaculate original condition. 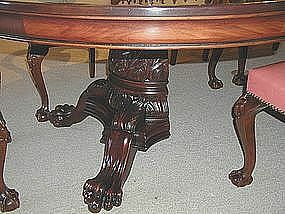 The graining of the burl on this set, especially on the bed, is exceptional. All three pieces are a matched set and were always together. 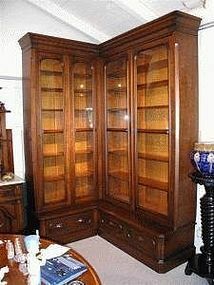 Empire style three stack lawyers bookcase, professionally refinished. There is a drawer on the bottom, and an original label on the back from Lundstrom. 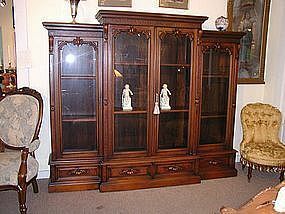 It measures 48" tall x 33 1/2" wide.